Our drain lines do a great job of keeping us safe and healthy, by taking our waste away from the home and to our septic tanks or public sewer system. Stoppages are a huge concern that shouldn't be put off, and they make up about half of all plumbing issues. 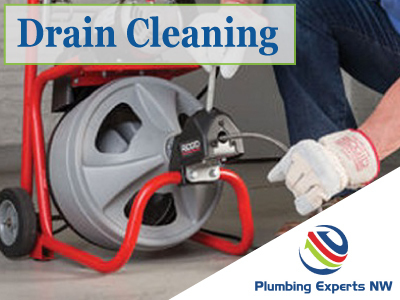 If you've run into a clogged drain, you'll need a drain cleaning service that responds quickly and with expert knowledge that clears the problem efficiently. That's why Plumbing Experts NW wants to handle your drain cleaning Mukilteo---stop letting these annoying clogs and stoppages make your home unsafe! Many years of experience handling home service plumbing gives us the expertise to diagnose your drain clog and give the best options, no matter what drain is acting up. It's the type of experienced drain cleaning Mukilteo WA families should be looking for. You need a clear diagnosis and clear options. So, just as we do with all other plumbing services, we are prepared to be your advisor, presenting all of your options for repair clearly. See the Reviews of Our Service in Plumbing & Drain Cleaning Mukilteo! Plumbing Mukilteo trusts for any problem that arises. Fast, friendly, and affordable plumbing service is what you'll get! Plumbing Experts NW does Drain Cleaning Mukilteo Needs, from the sewer line clogs all the way up to the kitchen sink. We clear those tricky sewer line clogs, and we do sewer repair in Mukilteo in case a greater problem is occurring.